How did Chopin and his contemporaries actually sense the composer’s compositions? As he reports himself, they listened to them played on Pleyel or Erard grands. The sound spectra of the three Erard fortepianos from the middle of the nineteenth century carry us away to the musical world of romanticism. 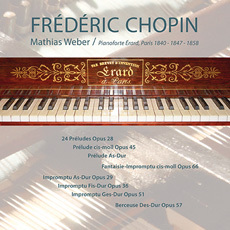 Unlike any other instrument the Erard grand is capable of conveying the chatoyant colourfulness and the subtle musical lines of Chopin’s oeuvre at its best. In his unpretentious and masterly piano playing Mathias Weber takes us to the remote world of an authentic romantic sound, which he revives by his performance and indeed manages to enchant us. What a great musical pleasure to listen to!